Whereas the Mazarin Quarter is laid out in a predictable grid, the Old Town is a labyrinth of narrow streets that seem to ramble without regard to objective or efficiency. As a result, interesting buildings and picturesque squares suddenly appear without warning. 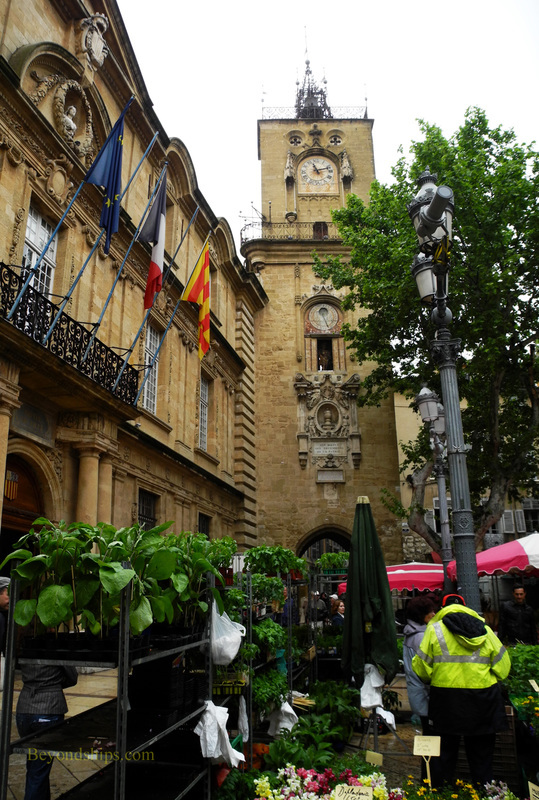 Perhaps the most famous of the Old Town's squares is Place de Hotel de Ville. 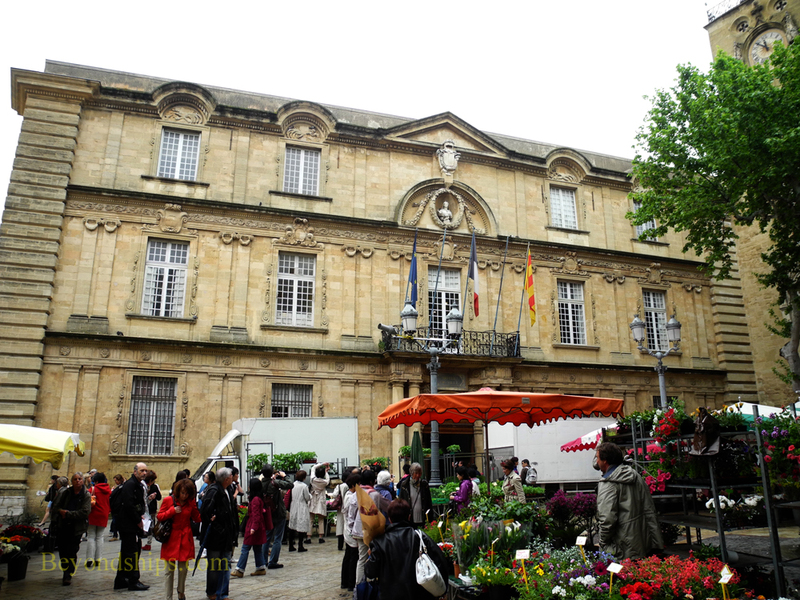 Tuesdays, Thursdays and Saturdays, a lively outdoor flower market gathers around its central fountain. In addition, the sides of the square include some important buildings. Of course, the square gets its name from the 17th century Hotel de Ville done in the Italianate style. Despite some destruction during the French Revolution, its facade is rich with carvings and sculpture. Beyond the central portal with its carved wooden doors, is an inner cobblestone courtyard. Constructed for meetings of the town council, the building remains a government building. Among other things, this is where you come if you want to be married in Aix. Thus, the building is open to the public. The meeting room is elaborately decorated. Next to the Hotel de Ville is the Clock Tower. The tower built in 1510 on Roman foundations. In 1661, the clock was added. Under the clock, four wooden figures representing the seasons of the year rotate. Inside the tower is a bell, originally used to warn the populace of emergencies, it now tolls the hours. Across the square is the Ancienee Halle aux Grain (Grain Exchange). Built in 1718, its chief feature is the pediment on which there are two monumental sculptures by Jean-Pancrace Chastel. They represent the Rhone and Durance rivers, which enable Provence to grow grains. Today the building is a post office. Another landmark of the Old Town is Aix Cathedral (Cathédrale Saint-Sauveur d'Aix-en-Provence). Located on the site of the old Roman forum, the cathedral was built over the course of the 5th through the 17th centuries and includes Romanesque, Gothic and Baroque elements. Of interest is the baptistry, which includes a 6th century octagonal baptismal pool and Roman columns supporting the dome. The Burning Bush triptych by Nicolas Froment is 15th century and is considered the cathedral's most significant work of art. Nearby is the Musee des Tapasseries, which is in the old archbishop's palace. The building dates to 1650 and features a vaulted Gothic Hall and a Baroque staircase. 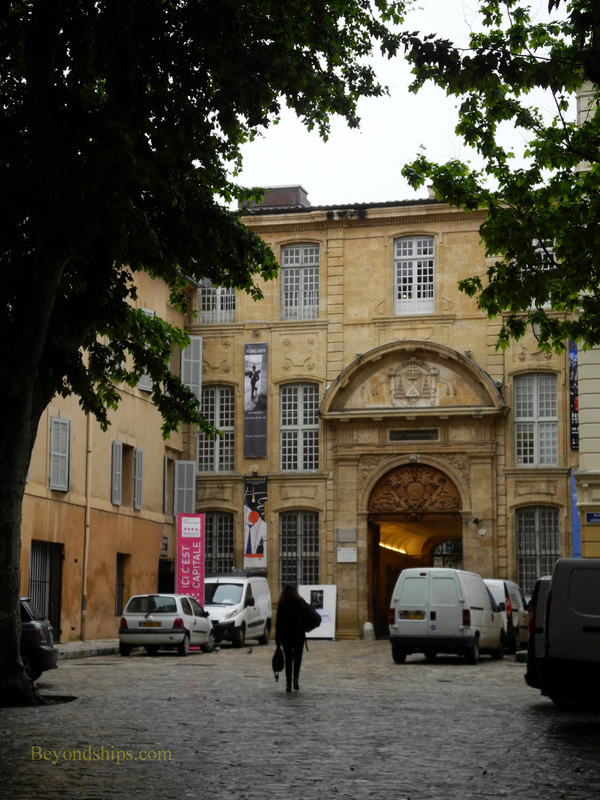 The museum has a permanent collection of tapestries and is also used as a theater in the Festival d'Aix. Also in the vicinity is the Hotel de Chateaurenard, a 17th century mansion. Designed by Pierre Pavilion, King Louis XIV was a guest here. It features a trompe l'oeil stairwell by Jean Daret. 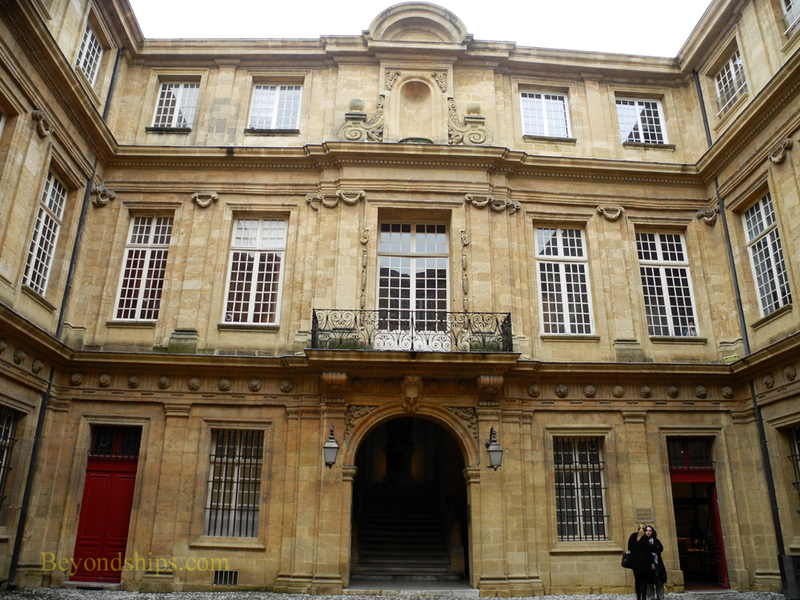 Above: The courtyard facade of the Hotel de Ville. ​Below: Scenes from Aix Cathedral. ​Below: The courtyard of Hotel Chateaurenard.